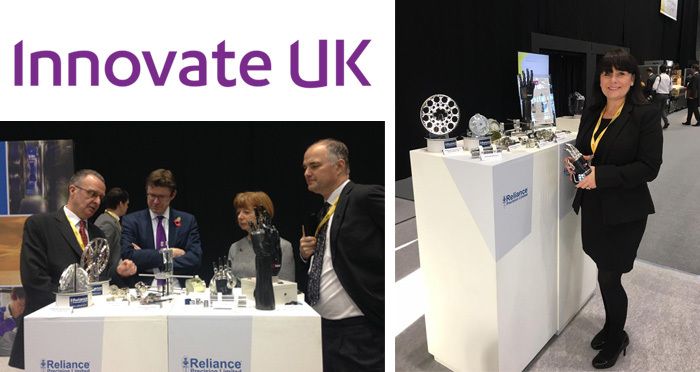 Reliance were delighted to be invited to showcase their products at Innovate 2016 last week, an event which puts the spotlight on UK innovation. Hosted by the DIT (Department for International Trade) and Innovate UK, the event showcases many of the UK’s world-beating technologies and innovations. Held 2-3 November 2016 at the Manchester Central Convention Complex, this year’s location (the first outside of London) put a focus on the proud innovative history of the North of England. Reliance were invited to attend by Innovate UK and exhibit on the Northern Powerhouse stand, whose purpose was to showcase the products and services of some of the North’s most innovative companies. Reliance was known to Innovate UK as a strong, innovative manufacturing company, having worked with Reliance on a number of development programmes including geared systems for Space. A selection of examples of Reliance’s work were taken to the event to demonstrate the company’s expertise in high accuracy, precision engineering. These included solutions for the Scientific Instruments industry and for the Aerospace, Space, Medical and Prosthetics sectors. The event was very well attended, with over 2,500 visitors from around the globe spanning many different industry sectors. Visitors included start-ups, SMEs, buyers, universities, research centres and government organisations. There were many influential speakers presenting throughout the course of the two days including a Keynote Ministerial address from the Rt Hon Greg Clark MP, Secretary of State for the Department of Business, Energy and Industrial Strategy.